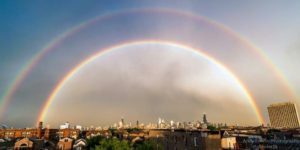 I saw that there was an amazing rainbow in Chicago yesterday. I’ve taken so many snaps of rainbows through my journey. This one in Chicago is amazing..but mine have been more amazing in my opinion along my journey and that’s because they were meant for me. A rainbow is a sign of hope and peace and they certainly do bring those feelings for me. My husband was an organ donor. He and our families chose to give the ultimate gift to five others waiting for their miracle. The night before my husbands organs were to be taken, there was a beautiful storm. He was a storm chaser, so that is why I call it a beautiful storm. The heavens were rolling. The thunder and lighting were loud and amazing..though nothing at the time was amazing. I remember thinking, this storm is for him! He would have had me in the truck, chasing the heart of it. After the storm was the most amazing rainbow. I wish I had a picture. The next day was the worst day of my life. I woke up at my best friends house, because I could not sleep alone in our bed. I can’t explain the pain of knowing he was gone, of waking up with such a heaviness in my heart, thinking of him on that operating table knowing his organs were being prepared for someone else, knowing this was real and he was gone. My heart had left my body at that time. I went home and took my first shower and dressed myself. I looked in the mirror and I truly couldn’t see myself, I looked so different. It’s crazy what you remember, but it’s so vivid for me those days..I know down to my shoes what I wore that day. I can see myself, which is hard to see. I was so broken. I drove to the airport. The jets were flying into the DeKalb airport and our families could come. Gift of Hope was so amazing and compassionate to us. I remember standing on the side of the runway, unbelieving. Looking at my life and thinking how can this be happening. Coolers, there were coolers with my husbands heart, lungs, kidneys. Regular coolers. There were two jets with life flight nurses and pilots. Amazing and again compassionate people. The pilot autographed a photo, which I have tucked away, not sure if it’s a memento I want to look back at, but I have it still. In between those jets though was a perfect rainbow. A rainbow that in such a hard time had me believe he sent it for me, for our families. Telling us I’m ok, be ok. Even writing this I have tears flowing. Life is hard…so hard..but what’s so awesome about it is knowing true and real love…feeling so much that it, makes you feel. I wouldn’t trade my life for one second. As hard as saying goodbye was, it was equally hard to start again..but i did and not without struggle, or continued struggles. Life is just that and we should not waste it. Grabbing that cooler handle that had Johns heart in it was something I will never forget. I released my husbands heart to the care of that jet and nurses to take to that family waiting so desperately on the other end. I cannot tell you how hard that was, even though I did feel for them and think of them and the anticipation and hope they were feeling in that moment. It gave me peace in a way that he helped so many live, though I had no real peace since he was not with me, or us.